I've posted a picture of this pool and falls before, but here's a different perspective from the patio behind the lodge, near the entry to the restaurant and gift shop. Inside the cave, this stream is called The River Styx, but I'm not sure what (if anything different) it's called after it exits the cave. The human entrance and hydrological exit to/from the cave is on the hillside just off the right edge of this photo. 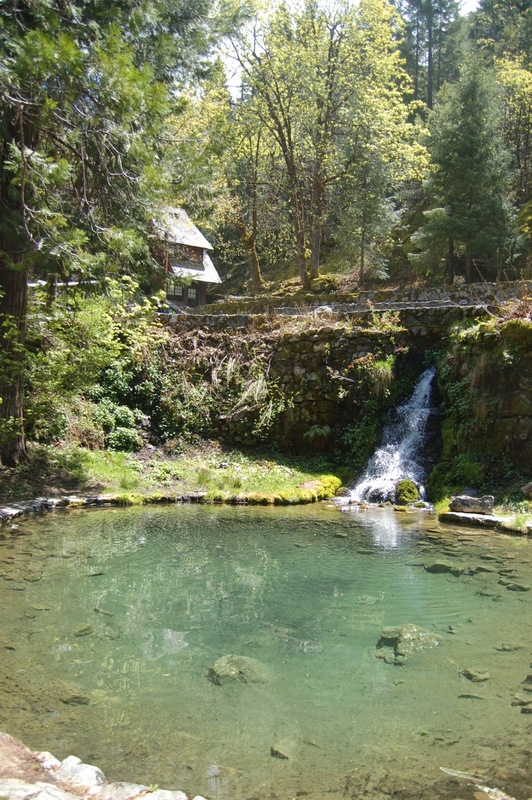 It passes under the road in a culvert, cascades down over the rocks seen here, enters the pool... and vanishes again. To reinforce a point I made recently, if water evaporation was the major cause of calcite precipitation, I'd expect to see travertine all over those rocks. No, I don't see any, either.